For almost 30 years volunteers from the the business community of the North Fork through the North Fork Promotion Council, Inc (NFPC) welcome and attract new visitors to our beautiful region, the North Fork. The NFPC publishes the Official NFPC North Fork Guide, and participates in the annual New York Time and Boston Globe Travel Shows. The NFPC represents most if not all local business organizations with a combined membership of over 500 businesses. We remain as the one stop visitor guide to our region, providing you opportunities to creatively showcase your business/industry, now with integrated app and website for digital users. What's new for 2018? 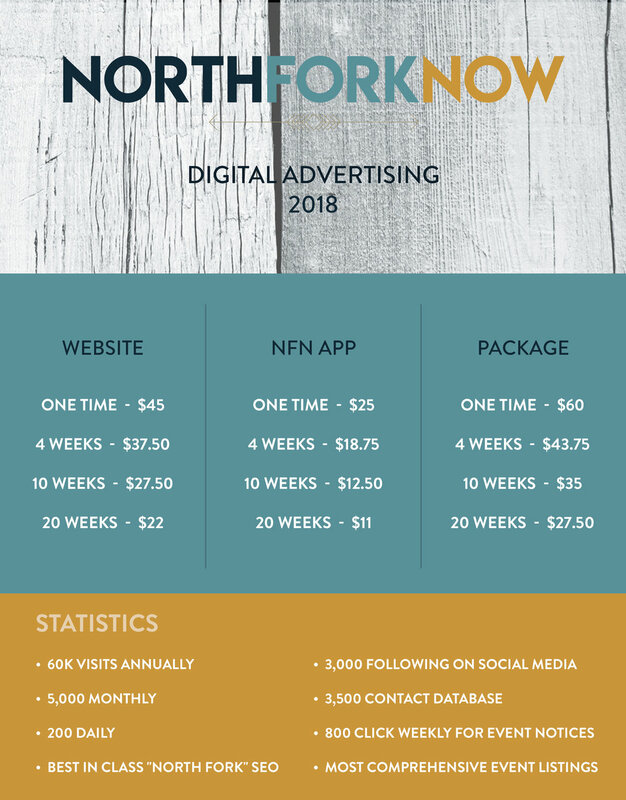 We offer competitive advertising rates over a range of media, whether its our highly circulated comprehensive North Fork guide, our website which reaches thousands of local North Forkers and businesses every week via our newsletter, or the North Fork Now app which we launches last year during the North Fork Trolley pilot and is destined to be even bigger this year! Packages also available. We can accomodate any budget and need.